As I write to you this Wednesday morning, we are culminating our time together at clergy retreat here in Maui. Our presenter is Rosa Say, author of Managing With Aloha. 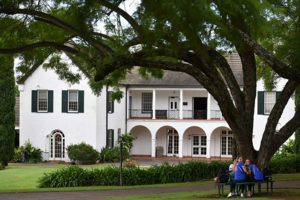 Seabury Hall in Olinda. Yesterday afternoon I took a mini pilgrimage from Kaanapali to Olinda to go to the chapel at Seabury Hall and marinate myself in memories of the first Eucharist over which I presided almost 13 years ago. While I was in the chapel, I recalled how every morning I used to go up (it was on the second floor of the main administrative building of the school), open the glass doors, and watch the sunrise over Haleakala. I remembered that, and it brought me peace. I’m also feeling very peaceful after preparing for Hurricane Lane and I am just so grateful that it dissipated before it could do any damage to the Cathedral. I am also grateful to the many people who showed up to put up the canvas shutters over the stained glass windows, and who helped to dismantle the tent. I have asked Bryan to make arrangements to have the tent put back up sometime soon. On Saturday my friend Dixie and I went and removed the canvas shutters that covered windows that we could open for Sunday morning’s services. I am considering leaving the others up until the end of hurricane season. They are in front of windows that cannot be opened, so it will not affect our ventilation in the sanctuary. See some pictures here! 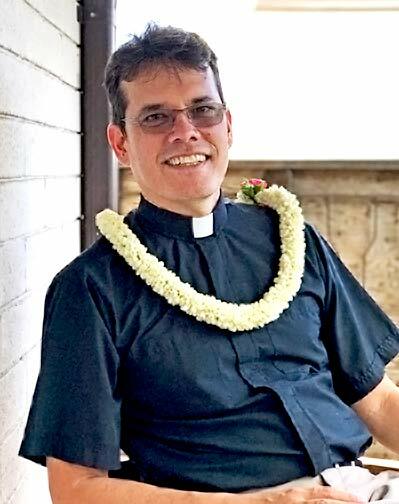 After I return to Honolulu on Wednesday afternoon, I am looking very much forward to the contemplative prayer session that I will hold on Thursday evening. 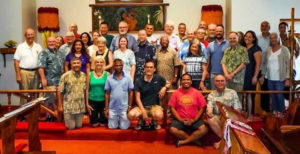 In addition, last week Monday I held a laboratory where six of us gathered and I engaged in a group spiritual direction exercise. The session went well and I would like to offer more sessions and open them up to the congregation now that I know it can work well I will let you know when those sessions will be offered. I also hope to offer more contemplative prayer sessions, and similar offerings in the future. I would also like to engage in more teaching at the Cathedral as we look to the future. On Friday morning, I am meeting with a small group of people who I am asking to serve as a team for soliciting pledge commitments for 2019. You can expect to hear something from us in late September or early October. In the meantime, I ask you to join me in prayer for the discerning what your financial commitment to the Cathedral might be for 2019. On Sunday morning, many of you noticed that the organ was misbehaving. Todd went to the piano to provide accompaniment for the 8:00 service, and I appreciate those of you who were supportive and gave both Todd and me words of affirmation and appreciation for the music sans organ. I appreciate everyone’s being flexible, most especially Todd and members of the choir. I think the fact that nobody got frazzled shows the strength of character of our worshipping community. We will have an Ali‘i Sunday this Sunday at 8:00 to honor the 180th birthday of Queen Liliuokalani. The following Sunday (September 9) I have a 2:00 PM flight to Manila, where I will be on an eight-day silent retreat. I will return to Honolulu on the morning of September 21. At the 10:30 AM service on September 9, Father Keleawe will preside and I will preach, so that I can leave for the airport immediately after the sermon to catch my flight. Thank you so much for understanding and a special thank you to Father Keleawe for being willing to help out that day. I would like to close this week’s missive with a special request that you take time out tomorrow to remember Bishop Chang on the first anniversary of his passing. I also ask that you hold his wife Dee and his children, grandchildren and sister in your prayers. He is sorely missed. Until we see one another at worship this weekend, please take care.